A perfect summer freezer friendly meal. Please note that we are packaging the veggies in a smaller baggie and nesting them with the pork chops in a larger bag. 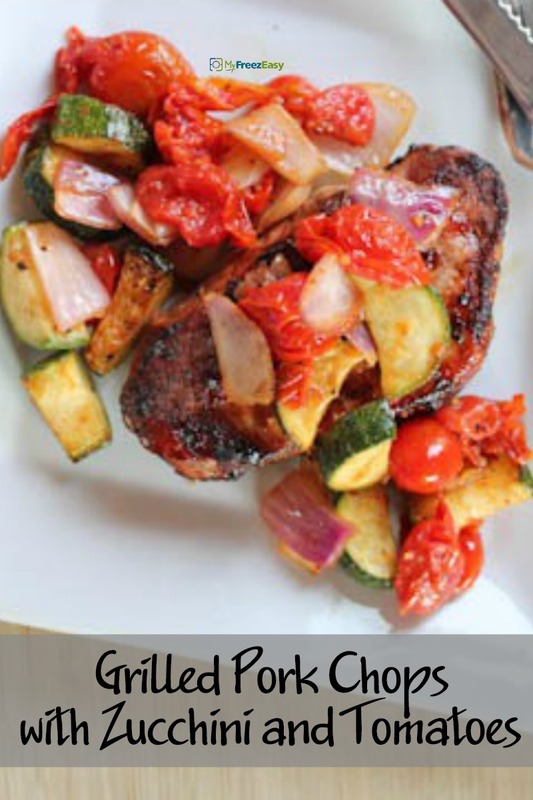 This way you can easily grill the pork chops and saute or grill the veggies in a grill basket. Enjoy! In a large bowl, toss tomatoes, zucchini, onion, olive oil, and salt and pepper to taste. Set aside. Place the vegetables in a grill basket and grill, turning or tossing occasionally, until crisp-tender and lightly charred, 8 to 10 minutes. Season pork chops with salt and pepper on both sides, and then grill until internal temperature reaches 145 degrees F, about 4 1/2 minutes per side. Remove chops from grill and let rest 3 minutes. Remove vegetables and cover to keep warm while chops rest. Prepare or warm dinner rolls. 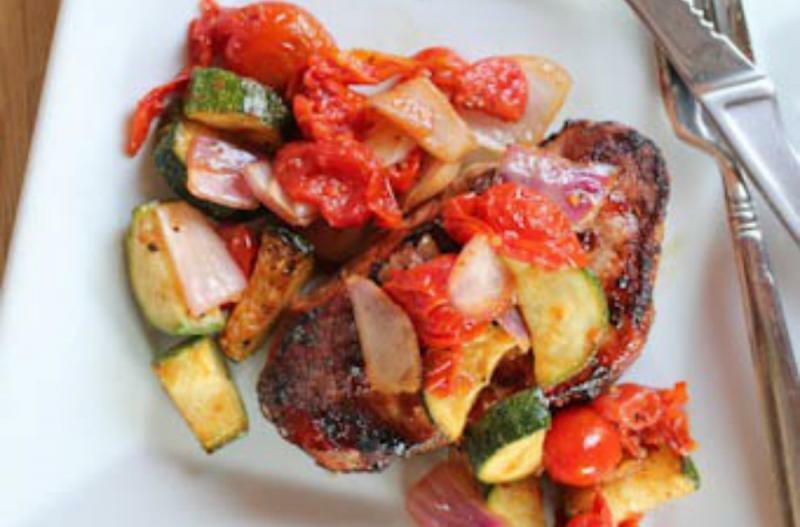 Serve Grilled Pork Chops with Zucchini & Tomatoes with dinner rolls. Slice 4 small zucchini into 1-inch pieces. Cut 2 red onions into 1-inch pieces. In a large bowl, toss 16 oz. cherry tomatoes, 4 sliced zucchini, 2 diced red onions, 1/4 cup olive oil, and salt and pepper to taste. Mix together and then evenly divide into 2 quart size freezer baggies. Put baggie in the freezer and freeze up to 6 months in fridge freezer or 12 months in a deep freezer. Remove the veggie pack from the baggie and thaw in the fridge. Thaw the pork chops in the fridge completely before grilling. Recipe is gluten-free when served with gluten-free sides, such as rice or gluten-free toast. Thaw completely. Grill the pork chops 5 to 10 minutes per side. Grill veggies alongside the pork chops.